Mighty No. 9 isn't even out yet, but that hasn't stopped its creator from talking about multimedia possibilities which he hopes will also include comics, TV shows and anime. Keiji Inafune clearly has big plans for his upcoming title, Mighty No. 9. While that's to be expected from a game that took in more than $4 million over Kickstarter and PayPal last year, his ideas are a little bit more ambitious. According to an interview with Polygon, Inafune sees the world of Mighty No. 9 as being even bigger than that of Mega Man, and he wants to see other creators explore it. "I'd like there to be a comic book, manga, anime, movie, TV drama series," he told Polygon. "Any possibility you can think of." Polygon reports that Inafune has already been contacted by writer and producer Tim Carter of Contradiction Films about a possible live-action movie adaptation of Mighty No. 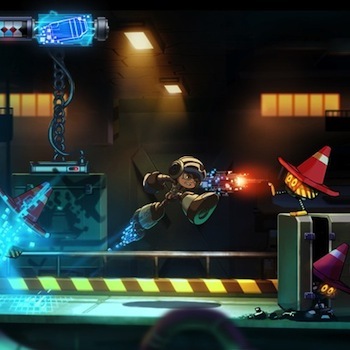 9, though so far Inafune's company, Comcept, hasn't committed to working with the studio. "It's not actually a 100 percent set deal yet," Inafune said. "It is something we are looking forward to and considering the possibilities of." "We've directly talked with Contradiction about many possibilities and I've talked to them about the large picture, the Mighty No. 9 universe," Inafune continued. He added that story details weren't really discussed between the two companies yet. "I'd rather they see how much there is to Mighty No. 9 and then play on that and make the story even deeper by using many different parts of this big universe we've created," he told Polygon. While the idea of a live-action movie may have caught some of you by surprise, Inafune points to the success of recent superhero films such as Iron Man, Spider-Man and Superman as proof that somebody could make a movie out of his game. It's not a bad point - after all, Tony Stark blasting through waves of foes with his robot armor isn't too far removed a concept from Mighty No. 9 hero Beck doing the same.